The Vism Sling Backpack is a great, ready-for-action pack, ideal for just about all your trips, missions, and adventures. This Vism MOLLE Compatible Pack features a number of different compartments and pockets, so you’re sure to find a specific place for just about all of your gear without worrying about taking up too much real estate. Intricately designed padded shoulder straps, carry handle, pistol compartment, and MOLLE compatible webbing, ensure that this pack is the one that’ll give you comfort, organization, and security. The Vism Military Backpack is constructed out of durable PVC material and padding to give you the support and protection you need for your gear and yourself. Front Compartments: Top 4.0″ H x 7.0″ W x 1.75″ D with 2.0″ H x 3.75″ W loop fastener patch sewn onto the front for hook & loop patches. •The Sling Backpack has a Main zippered compartment of 720 cu. in. of space, with internal zippered and mesh pockets. •The Middle zippered compartment of 350 cu. in. of space with three internal pockets. •The Front Top Compartment (49 cu. in) has a loop fastener patch on the outside for hook & loop name tapes and/or moral patches. •The Front Bottom Compartment (161 cu. in.) with some internal organizational pockets and a Snap-Hook keychain holder. 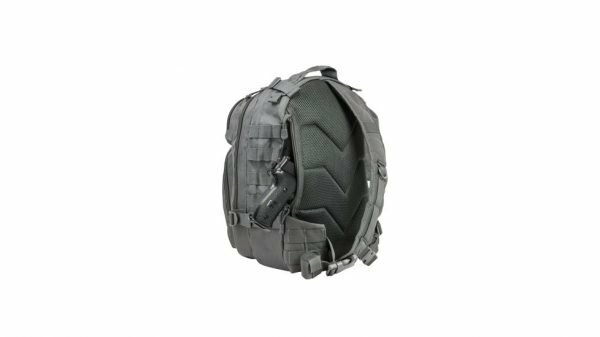 •MOLLE compatible webbing sewn onto the Bottom Front Compartment and the Sides of the backpack, to make the Sling Backpack a modular system. •The backpack also features a large discreet, padded, and lockable CCW Pistol Compartment on the back with a small padlock compatible Metal Zippers (padlock not included). •Other features include: adjustable padded single shoulder strap with quick connect buckle, adjustable side support strap with quick connect buckle, and a top heavy duty carrying handle. •This is a Sling Backpack has a lot of storage space for its size with many compartments and pockets to help organize your gear. •A discreet way of carrying a concealed carry weapon.